Last Chance Clearing House Sale | P.C. 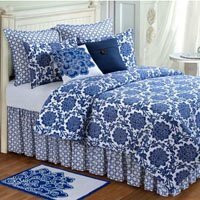 Fallon Co.
Shop now to snap up incredible deals on a selection of top quality quilts, bedding, window treatments, pillows, tabletop decor, and more from top designers including C&F Enterprises, VHC, and more. These styles include overstocks and retiring colors or patterns. No rainchecks on these incredible deals. Hurry before all of these great deals are gone! Select pillows, bedskirts, quilts, kitchen linens, table runners, home decor, and more!